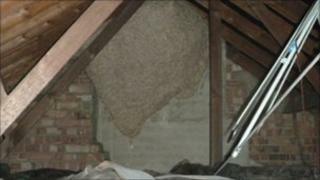 A 6ft-high wasp nest has been discovered in the attic of a Southampton pub. Pest controller Sean Whelan was called in to deal with the 6ft by 5ft (1.8m by 1.5m) nest which housed a total of about 500,000 wasps. Mr Whelan said after exterminating the insects, the nest had to remain where it was because it was too big to remove from the attic. Oxford University experts have verified the nest is Britain's biggest ever. They said they thought it was also the largest found across the world in the past 50 years. The pub which housed the nest has asked to remain anonymous. Mr Whelan told BBC Radio Solent: "The wasps will never go back in it, so we will just leave it to disintegrate. "I had been staring at it for quite some time but I did not recognise it because it was very big. It was a bit scary [but] it was mesmerizing and very challenging." "I think it has been a very mild spring and obviously summer has been quite dry - that's helped," Mr Whelan added. "The experts feel [the nest] has lasted through the winter from last year [and] that is why it is so big." The nest is 15 times bigger than the UK average and nearly as big as a Smart car, which is slightly longer at 8ft 10in by 5ft 1in (2.69m by 1.54m). Nationally, pest control experts revealed on Wednesday that the number of calls to remove wasp nests more than trebled last month. The increase has been blamed on the warm weather and household nests going untreated last year as people have been cutting back their spending during the recession.